Is the Big Bang Theory a viable theory for explaining the origins of the universe? 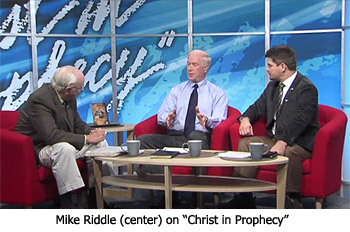 We asked this question on our television show Christ in Prophecy of Mike Riddle, the founder and director of a wonderful ministry called the Creation Training Initiative. It's a biblical discipleship ministry that teaches Christians how to defend their faith using Genesis and the teaching of a literal 6-day Creation. Dr. Reagan: Scientists say the universe began with a big bang, an explosion. What are the problems with that theory? Mike Riddle: The first problem is that nowhere do we see the Big Bang in the Bible. The next thing we have to understand is what exactly is the Big Bang Theory? Why was it invented? Well, the Big Bang Theory was originally invented to explain everything in this universe without a Creator, and that's the first big problem. The second problem is that it doesn't agree with Science. This is where a lot of people are going astray. The Big Bang does not agree with Science. There are many scientific evidences that refute the Big Bang. One of the things I like to cover in one of my teaching courses is what is being taught in the schools. Rather, what they are not teaching in the schools. What we find in our public education system is that they are teaching Evolution and not real Science anymore. For example, let's talk about the Big Bang. Where did the matter come from to create the Big Bang? What exploded? You can't have something go "bang" until you have something that can go "bang". That's just common sense and logic. A second question is, "What caused that something to explode?" Those questions are not allowed to be asked in a lot of our universities classrooms, mind you. Then we have other problems. Did you know the Big Bang does not explain the origin of the stars? Stars do not form by naturalistic processes. No one has ever observed a star come from anywhere. So, where did they all come from? We get this idea from our textbooks that these great big dust clouds called nebula rotate around and around and around. As they rotate around and around we are told the gravitation collapses inward and after a period of time they form a star. Nathan Jones: A dust cloud forming a star? Mike Riddle: I give a technical term for that theory. It's called "bologna"! Did you know that we can do this experiment in the classroom where as the gas cloud rotates around it will begin gravitation and collapse inward? But, do you know what happens as it collapses inward? It generates heat pressure, and we can measure this. That heat pressure is always stronger than the gravity and always causes the cloud to expand outward, not inward. So, we have no scientific proof for how stars are formed. It's all conjecture based on Evolutionism. Then we have things called spiral galaxies. These are galaxies rotating around out there. Our Milky Way is a spiral galaxy. But, after so many rotations, they lose their spiral shape. So, if these galaxies are billions of years old, they should not be spiral shaped. Clearly there are many problems with the Big Bang Theory that don't explain the origin of the galaxies. Nathan Jones: Planets are even spinning around the wrong direction, too, right? Mike Riddle: Right. We have planets spinning the wrong way. We have what's called supernovas, which is a fancy term for stars that exploded. They've used up all their energy and then explode. In our Milky Way galaxy alone, and this is why they don't teach this, we only find enough exploded stars for an age of about 6,000 years. Isn't that amazing? Also, the fact that we have comets shows our solar system has to be very young. The Big Bang doesn't provide for the age of comets. Dr. Reagan: Not only does the Big Bang Theory have that problem and all the problems that you mentioned, but how many explosions have you ever seen that created order? Mike Riddle: None. Order is not created from chaos. Having been in the Marines, I know that for sure! Adherents to the Big Bang Theory teach that somehow the matter got there out of nowhere. How the matter got there, we are not allowed to ask. That matter then somehow started to expand and grew into a hot fireball. It exploded and created an expansion of space and time, and yet it has no center. That's the main part proponents of the Big Bang Theory cannot explain either. Nathan Jones: Speaking of stars and them having to be young, wouldn't it take millions of years for their light from some of these stars to reach earth? After all, light takes a long time to travel, and 6,000 years is clearly not enough time. How do you explain that? Mike Riddle: When we look at those great distances between stars, on the surface level that looks like it would be a problem for Christians to explain. Here's the situation. The Bible teaches the earth is about 6,000 years old and was created in six literal days. So, if these galaxies out there are millions of light years away, how in the world could their light reach us in only about 6,000 years? We do have possible scientific explanations that could be right, and they could be wrong. We just don't know for sure. We mustn't forget that we have a God who can do anything. We tend to limit Him too much. He could get that light here. He could have used any scientific means. He could have used some miracles. But, our God we forget is all powerful and all knowing, for after all, He created everything out of nothing, so He can get the light here in the time that is needed for us to see it. Aside from that, we do have some possible scientific explanations. Nathan Jones: Yes, what are those scientific explanations? Because people don't generally take the, "well, God can just supernaturally do it" argument. Mike Riddle: True. Without getting into all the details which people can get online from the Answers in Genesis website or the Institute for Creation website, there is a scientific explanation called Time Dilation. It's about how gravity affects time. The greater the gravitational pull, the slower time will go. We can measure that using our atomic clocks, so we know that relationship happens. If we have a greater gravitational effect here on earth, then time could be going slower here than it is out there. Those stars could have aged hundreds of thousands and millions of years in just 6,000 earth years. Now, I'm careful when I talk about that, because we can get glazed eyes talking about that kind of stuff. Nathan Jones: Oh, no, I find it fascinating. Mike Riddle: There are other possible scientific explanations for why starlight appears to be millions of years old, but what I like to point out is what Evolutionists don't teach. The Evolutionist have a bigger problem than we do with the distance of starlight. First of all, they have to get their light source from stars. Well, where did those stars come from? They just make up rescue mechanisms by diverting the question away from origins. Here is another problem Evolutionists have, and that's related to the temperature of the universe. When we look out all around this universe, it seems to be what we call a homogenous or consistent temperature. There has not been enough time in the alleged 13 billion years for the light energy from this side of the universe to have traveled over and interact with the other side of the universe. In order to get a homogeneous temperature, all the light energy has to have interacted. But, there has not been enough time. Why then is the temperature all the same? Here is what the Evolutionists do, they have their answers and explanations for these things, but I'll point out every one of their explanations are not based on observable science. They use what we call a "rescue mechanism" to rescue their philosophy. In reality, the distance of starlight both believer and non-believer ultimately have to accept is by faith. What does your faith in Evolution have to offer me? I'll tell you what my faith in Jesus Christ has to offer you. In the fifth segment of this Creation training series with Mike Riddle, he'll explain why the Gap Theory makes no sense. I believe in the theory of evolution. My theory is that scientific knowledge is evolution. It evolves for two reasons. 1. A whole lot of what "scientists" think they know proves to be false. 2. "Scientists" must continually come up with new theories to prove to themselves that there is no God. The Bible even separates the night from the day and states after each creation.And God called the light Day, and the darkness he called Night. And the evening and the morning were the first day. . this was the first day, this was the second day, etc..
No Big Bang in the beginning but watch out God may end it (sinfulness) with a Big Bang. I hate to HAVE to say it, but I agree,, and I am afraid we will be the ones with the big bang first. We are letting the Gov. rule us.. if you read the news on the Rapture Ready... you will see..some headlines that show how low we are going..
we now have a president who does whatever he pleased and NO ONE cam stop him. (it seems). now he is thinking about bringing Syrian refregees to America. and you can bet they will be Alcada, the biggest majority of them.. I don't believe it is just for votes.. also think they just might use the drones against us,, filled with chemicals or biological. God won't be mocked and we are shaking our fist at him. This is also a headline that proves who OBAMA really works for..
We all need to be glad we are protected by our Lord and Savior. For myself, when it comes to "Big Bang" the question to be answered is: "Did God create the Universe through an event just recently discovered by mankind in the past century and which we refer to as "The Big Bang"?" Working from a position of hindsight (greatly increased knowledge of which the angel Gabriel prophesied for the end of the age) this is a simple question to answer. At least to my very scientifically and technically inclined mind it is. This question must be answered without any man-made "spin," and only on the basis of the recent discovery reconciling with God's revealed Word on Creation. For the intelligent and thinking human being the essence of this issue reduces to him or her confirming whether or not observable evidence for "The Big Bang" conforms to the Hebrew-language context of Genesis 1:1-5. If one does not find this then one is left with only the Word of God in Genesis 1:1-5 and one believes this by faith alone. For some, that is all he or she requires. However, if another does find conformity then that one has the the Word of God by faith confirmed by observed facts manifest in the physical evidence of the Creation itself; the observed facts providing details and proof of the Omnipotent God who Created everything that exists by the Word who has provided for the salvation of the whole of Creation. This is my conviction by the Holy Spirit. Do not deceive yourselves. If any one of you thinks he is wise by the standards of this age, he should become a "fool" so that he may become wise. My cut and paste didn't work properly in the last post. Childlike faith in the Word of God is the greatest blessing in my life. Do not deceive yourselves. If any one of you thinks he is wise by the standards of this age, he should become a "fool" so that he may become wise. 19 For the wisdom of this world is foolishness in God's sight. Child-like faith is magnificent and I revel it it myself. By the same token so is scholarly research when it points to the possibility that the six literal days of Biblical Creation may well be one and the same as 14+ billion light-years when viewed from the LORD's perspective of time. Is there anything in Genesis 1:1 which indicates what time scale Yom Echad occurred within? To God, as the Bible metaphorically informs us, a single day is as a thousand years. That is the greatest indicator there is that God Almighty exists outside of the space/time constant as we understand it. By His very nature, which we can not possibly hope to fathom, His Creation can and probably does exist on at least two different time scales simultaneously. Perhaps more. Only He knows. Proverbs 30:5 - “Every word of God is pure …” God says what He means and means what He says. The Bible is meant to be interpreted plainly, or not interpreted at all, to be easily understood. Genesis 1:5 - God Himself named and defined “Day” as the light period, and “Night” the dark period comprising one solar 24-hour day. If a day was an age, e.g. 1000 years, this would mean there would be 500 years of light and 500 years of darkness. Genesis 1:5 - “Yom,” this Hebrew word for “day.” It is first used and defined in verse 5. It is used 410 times in the Bible in association with a number, e.g. 1st day, and in each instance it always refers to a 24-hour solar day. Genesis1: 5,8,13,19,23,31 - After each day of creation, God specifically declares His act was completed in one day. He counts each day off day because He wanted to make it clear. Genesis 1:11; 1:16 - Plants were created on Day #3; the sun was created on Day #4. This presents no problem if a day is 24 hours, BUT it’s a big problem if a day was 1000 years. All plants, which need sunlight to survive, would have died. Genesis 1:16 - “…the greater light (sun) to rule the day, and the lesser light (moon) to rule the night ….” This obviously refers to 12 hour periods, not hundreds of years ruled by sun, or hundreds of years ruled by the moon. Exodus 20:11 - “For in six days the Lord made the heaven and earth, the sea, and all that in them is, and rested the seventh day …” You’d have to throw out this verse. Exodus 31:17 - “… for in six days the Lord made heaven and earth, and on the seventh day he rested, and was refreshed.” If a day were 1000 years, we would we have a thousand year rest (Sabbath). You’d also have to throw out this verse. Genesis 2:2,3 - “And God blessed the seventh day, and sanctified it ….” The Sabbath was declared as Day #7. We don’t have a 1000-year Sabbath. Exodus 20:11b “…wherefore the Lord blessed the Sabbath day and hallowed it.” We don’t celebrate a 1000 year Sabbath. Genesis 2:2,3 - Adam was created on Day #6, and lived 930 years. He obviously lived beyond Day #7 when God rested because He and Eve had fellowship with God, and Adam had numerous sons and daughters. If a creation day was 1000 or a million years, Adam would have never seen Day #7. Romans 5:12,13 and 1 Cor 15:21 - “Wherefore as by one man sin entered the world, and death by sin ….” If God used billions of years to create the earth, then extreme death (as evidenced in the fossil record) occurred before Adam sinned. These verses clearly state that death began only after Adam sinned. Genesis 1:1-31 - The creation week initiated our current (and historical) 7-day week. Ask an atheist or evolutionist where we get our current 7-day week – God gave it to us. Luke 3:23 – The genealogies from Jesus backwards to Adam indicate the earth and mankind are approximately 6,000 years old. That is the Word of God. Not Billy. Ah Billy, et al - I have to say it is nothing if not entertaining to read all of your comments. Devotion to literalism is truly impressive. Then there is Sean who has gone beyond literalism to consult with the Holy Spirit for actual proof. Then there is Maria, who among other thing thinks Mr Obama is working for the devil. Sure thing, Maria. Anyway, just my opinion, but I think the Big Gang occurred when the faithful (of any religion) chose believing over fact. The Bang was your mind slamming shut. Someday Sean, Maria and I will be together on Earth enjoying eternal life and discover which of our viewpoints were fact or which were misinformed. Read and believe John 3:16 and you, too, can be there with us for eternity with Jesus! Billy, thanks for the reply - Not big on Biblical stuff or bornagainess but I believe this is the first time I have heard of "will be together on Earth enjoying eternal life". "on Earth"? I am assuming this is a part of the second coming. I believe that has supposed to have been eminent for going on 2000 plus years. And with all due respect John 3:16 isn't doin it for me. I'm OK just knowing life was fun as long as it lasted. While I've got ya, what is all this fear God stuff. If God is loving why should anyone fear It? We are all intelligent and thinking human beings - what I wrote was not a slight against anyone. Nothing subtle or otherwise was intended. I also do not care if someone disagrees with a viewpoint I may have; if another person's viewpoint can be shown to be correct or superior then I'll adopt it as well. It's all about discussion of the views and evidences for why they are held. How do you interpret the word "generations" in Genesis 2:4 within the context of Genesis 1 and Genesis 2:1-3? "These [are] the generations (towlĕdah = course of history (of creation etc)) of the heavens and of the earth when they were created, in the day (yowm) that the LORD God made the earth and the heavens..."
The "generations" (towlĕdah) of the heavens and the earth are in the same context as in the day (yowm) that the Lord accomplished the whole of His Creation and then rested, and also in the same context as referenced in Genesis 6:9 where Noah's "generations" (towlĕdah) are noted; that Noah was perfect (tamiym = in his generations from Adam. This seems to indicate a different time scale for the days of the Creation, just as the distance in time that existed between Adam and Noah. OGD, of course you believe in God. Why else would you troll websites looking for arguments that support God's existence unless you didn't already believe in Him? So, of course you believe. As there is a God, and He's in charge, one day you'll have to give an account to Him. He'll ask you if you took that lifeline of salvation through the death of His Son Jesus which would have rescued you from the death sentence of Hell due to your rebellion, or if you rejected it. What will you say to God then? I take your word for it and stand corrected. I was mistaken because a friend of mine would do that to me, he'd say "An intelligent person would think this...", alluding I wasn't. My mistake and I apologize. As for your comment all I can say is how would you discount everything else? You only disputed 1 of 15 references. It's fine with me that we agree to disagee. As I said, WE have eternal life and WE will be on the eternal Earth. I'm definitely not saying anyone isn't saved over the Earth age issue (not that you or I implied that, just clarifying). Hi Nathan - Believe in God, I really don't think so. I have asked myself why do I need to believe in God and can't come up with a reason. And I don't think it's ego. I do have an aversion to authority figures so deep down that's probably part of the answer. As for the trolling (which is interesting as another site used the word as a noun, before they kicked me off) I do have a genuine curiosity around why people believe what they do. I apologize but this guy Mike Riddle is almost comical when it come to some of his comments. Example - The Big Bang didn't happen because it's not in the Bible? Simplicity at it's best. I'll leave you guy to what you do best. Do you really believe it all just ends at death? REALLY???!!! You must then consider your life to be the biggest waste of time and biggest joke ever played on living being. How can ANY life be considered "fun" knowing it could last only 100 years, or even less than 1 year. If you are okay with that viewpoint then I will never understand your thinking. There IS an alternative. That you were created by a loving and merciful God who has offered you eternal life by sacrificing His Son Jesus to pay the price for the sins of the world. We are all sinners and the Bible says the wages for sin is death. But Jesus paid the price for that sin on the cross and through His resurrection offers you the FREE gift of eternal life. I pray that you open your mind to this. I pray that you read the Bible. If it is not true as you think then what do you have to fear? By ignoring and resisting God, YOU ARE fearing God. Your are afraid that if you open your mind/heart to God then you may believe. Beleivers in Christ do NOT fear God. We experience the LOVE of God. We have NO FEAR of death. NO FEAR of the future. Our lives have meaning and purpose. Can you HONESTLY say you do NOT fear GOD as I have said? Can you HONESTLY say your life has meaning and purporse based on your view? Please, I beg you, read the Gospels! Know the love of God and experience the deepest joy you will ever know. Oh Nathan...sorry I didn't answer your question. What would I say to God. Since it will be too late to do anything at point...how about - OOPS. Billy, I was about to sign off and saw your note. To your primary question...I don't consider the time I have spent here a waste. Conversely I believe that mankind's biggest ego trip is believing he can have eternal life. I did not discount the multiple points you made. I just wanted to show that in Genesis 2:4, in that single sentence, there appears to me to be a tri-fold reference to the time scales involved in the Creation event. "These are the generations of the heavens and the earth when they were created, in the day that the LORD God made the earth and the heavens." c) "in the day" (singular time reference) that the LORD God made the earth and the heavens which have both "generations" and are the 7 literal days of the Creation. In the Book of Genesis the phrase "the generations of" is a consistent theme throughout. I prayed often for you this weekend to open your heart and mind to the Word of God. I still pray that you WILL read the Gospels that you receive Jesus as Lord. OGD "Conversely I believe that mankind's biggest ego trip is believing he can have eternal life." OGD, eternal life is offered to us as a gift via His Son Jesus. Apart from this man cannot have eternal life. So it has absolutely nothing to do with the ego of a human being. My "ego" can NOT give me eternal life.